Systems that use natural processes in order to treat, infiltrate, evaporate, and/or reuse stormwater. Green infrastructure uses soils, topography, and vegetation in a way that minimizes the impacts of polluted stormwater and maintains water quality of urban environments and water bodies. 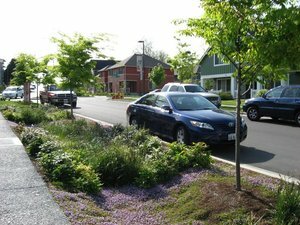 Examples of green infrastructure include rain gardens, bio-retention, tree-filter systems and porous pavement. The purpose of the project is to identify opportunities within the City of Chelsea where Green Infrastructure can be introduced as an amenity into neighborhoods to improve the aesthetics of the street and reduce pollution to local waterways. Efforts underway include an assessment of existing conditions, dialogue among all interested stakeholders and development of a ‘Neighborhood Greening Plan’. The project is focused on the Broadway corridor where the City of Chelsea is planning a significant upgrade of existing ‘gray infrastructure’ during the next five years. This project is funded by the Metro Boston’s Sustainable Communities Program. For more information contact Patrick Herron, Mystic Monitoring Network Director, Patrick@MysticRiver.org. Key partners in the project include residents, property owners, businesses, non-profit groups and the City of Chelsea. The project has invited input and efforts through public meetings, youth surveys and private dialogue. Partners in the project are still seeking input and participation from local stakeholders. You can be involved! Leaders of the project include the Mystic River Watershed Association (MyRWA), Charles River Watershed Association (CRWA), Chelsea Collaborative, the City of Chelsea and the Massachusetts Area Planning Council (MAPC). The Chelsea Green Infrastructure Project draws upon the expertise of these partnering organizations while developing and perfecting new tools and models to manage stormwater and to promote environmental restoration in a densely developed and highly impervious neighborhood. WHAT ARE EXAMPLES OF GREEN INFRASTRUCTURE? 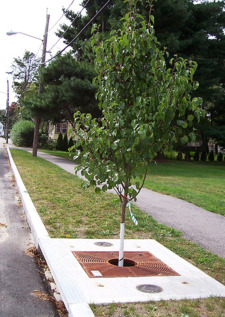 Stormwater tree pits consist of an underground structure and above ground plantings which collect and treat stormwater using bioretention. Photo courtesy of the Neponset River Watershed Assoc. 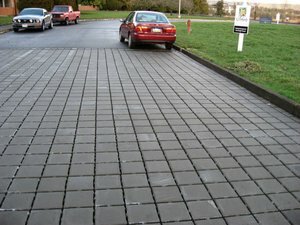 Permeable pavers promote groundwater recharge. EPA photo. Vegetated swales collect runoff and allow infiltration. EPA photo. Community members attend a public meeting. Chelsea serves as an ideal location in which to implement and test new strategies for sustainable development as it is considered an environmental justice community with a solid history of civic engagement in local environmental issues. By implementing this project in a model urban community faced with the region’s most challenging issues to overcome, project proponents create better understanding of the key issues and challenges associated with development of green infrastructure in a densely developed urban setting. Through further evaluation, proponents will be better able to share data and experience obtained through this process with other urban communities striving to meet the same health, pollution and liveability goals. MyRWA and partnering organizations analyzed the Broadway neighborhood for the best locations to install green infrastructure to reduce and treat stormwater runoff. A neighborhood assessment survey was conducted by youth from the Chelsea Collaborative. The trained youth assessed lot size and type, yard and lawn conditions, overall cleanliness of the neighborhood and catch basin cleanliness. A primary goal of this project is to engage a broad cross-section of residents in community discussion about the needs and planning process of green infrastructure. Outreach efforts include community meetings, design charettes, and surveys conducted by youth from the Chelsea Collaborative. The completed Neighborhood Greening Plan will include a comprehensive green street design for Broadway Avenue as well as recommended retrofits for sites within the surrounding sub-watershed that will help meet identified water quality improvement and runoff reduction targets as well as neighborhood greening goals. Increased community knowledge of stormwater runoff and green infrastructure. Development of a set of recommendations and conceptual drawings that will be inserted into the planning process for the upcoming Broadway work.